ore than anyone Ive known, Bill Poole lived his life exactly as he wanted. It was as if hed stepped out of You Cant Take It With You, the Moss Hart and Irving Kaufman play, and Frank Capra movie. He and his wife, Margaret, lived in a small house built in 1930 that theyd found in Niagara Falls, Ontario. They bought it for $200, disassembled it, and moved it to a piece of land in Grimsby; it sits atop the Niagara escarpment, overlooking the town and Lake Ontario. The houses principal source of heat is a wood stove. They bought an old fruit barn and turned it into a print shop where Bill worked almost every day, dressed in his ink-stained printers apron, a tuft of hair sticking up, producing posters and books. Each year he selected a short piece of prose he admired  a lecture by Robertson Davies, for example  obtained permission, then handset, printed and bound a Christmas keepsake for friends. In the late 1980s, Bill, Joseph Brabant, a Lewis Carroll collector and scholar, and George Walker, a colleague at the Ontario College of Art, decided to produce the first Canadian edition of Alice in Wonderland. Bill set and printed the book, George created 96 original wood engravings, Joseph oversaw the project, and five years later they published Alice in an edition of 177 copies. They then turned to Through the Looking Glass, which they published in 1998. Another of his mentors was Carl Dair, the renowned typographic designer, who died in 1967. 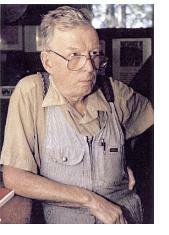 In the early 1990s Bill was instrumental in establishing the Mackenzie Heritage Printery Museum in Queenston. A colloquium he organized in Dairs honour included an extensive exhibit of the designers work. But the most important way Bill honoured his mentors was by quietly serving as mentor to dozens of young artists and designers. He organized two annual events to showcase the work of other private press printers, including former students. One was a Book Arts Fair, held in late fall at the Ontario College of Art & Design; the other was Wayzgoose, held in Grimsby every spring. (In the old days, when a young printer completed his apprenticeship, he prepared a goose dinner for his master before setting out on his own.) Bill and his daughter Lyndsay also served as distributors of private press books. As a package designer by trade, Bill developed a keen interest in the history of glass bottles as packages. They were not just objects buried long ago to be dug up by 20th century archaeologists, he wrote in the preface to a book he began writing a quarter of a century ago. (I was his editor.) The text had been completed years ago but only the first third of the book had been set and printed when he died. Publishing others always came first. Hed had the fun of researching and writing the book, he said. Getting it into print wasnt that important. Bills son, Michael, found an old sleeping cabin  the forerunner of motels. The Pooles turned it into a chicken coop, where Bill raised prize-winning chickens. He kept them, he said, not because he wanted to earn a few extra dollars or because he loved eating chicken  he never, at least knowingly, ate it  but because chickens were dumb. It helped him feel better about himself to be reminded every day that there were creatures on this planet dumber than he was. In late winter, 2001, Bill, now 77 and somewhat frail as a result of recent surgery and radiation, went out to the coop, where he found a dead chicken. His practice was to toss dead chickens over the escarpment as food for other animals. This time, however, he slipped and fell over the escarpment, along with the chicken. His body was found some hours later. It was a curious way to die. But knowing Bill, I can imagine him telling the story of his demise and roaring with laughter. Hed have seen it as a fitting end to a wonderful life.